No company operates in a vacuum. Promoting your distinct advantages as a company requires a clear understanding of your industry, your marketplace and your direct competitors. It’s also important to research and recognize the current external perceptions of your own company. The Internet has made these types of information highly accessible. Monitoring brand perception, industry trends and the competitive landscape should be an active component in your planning process. The Brand Positioning Assessment is a graph that helps you to plot where you are in relation to your competitors across four key brand attributes. Brand Differentiation – How effectively does your brand capture the attention of prospects? Brand Relevance – How aligned is your brand to your customers’ and prospects’ needs? The results of these two brand attributes determine your overall Brand Distinction and are plotted on the Y-axis of the graph. Brand Promise – How consistently does your brand deliver on its promises? Brand Intelligence – How well does your company understand its brand and the quality and impact of the brand experience on your customers? The results of these two attributes determine your Brand Equity and are plotted on the X-axis of the graph. The graph quadrants allow for placement as Emerging, Growing, Leading and Declining. The assessment will help you to understand if your brand is properly positioned to get you where you want to go. It will further assist in discussing what authentically differentiates your brand, and will contribute to a clearer judgment of where you are in relation to your primary competitors. Remember – if you don’t know where you are going, you will never get there. 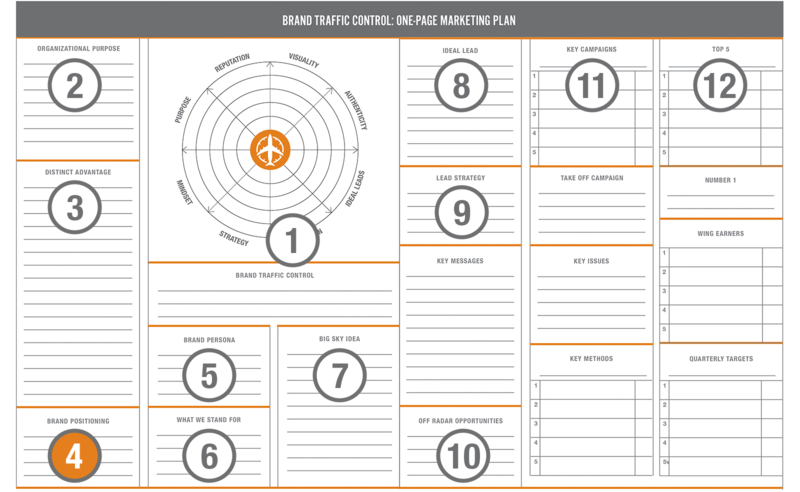 To download The One-Page Marketing Plan, click here.